Half a year gone since a black hole formed over Central City, and it's still recovering from the destruction. 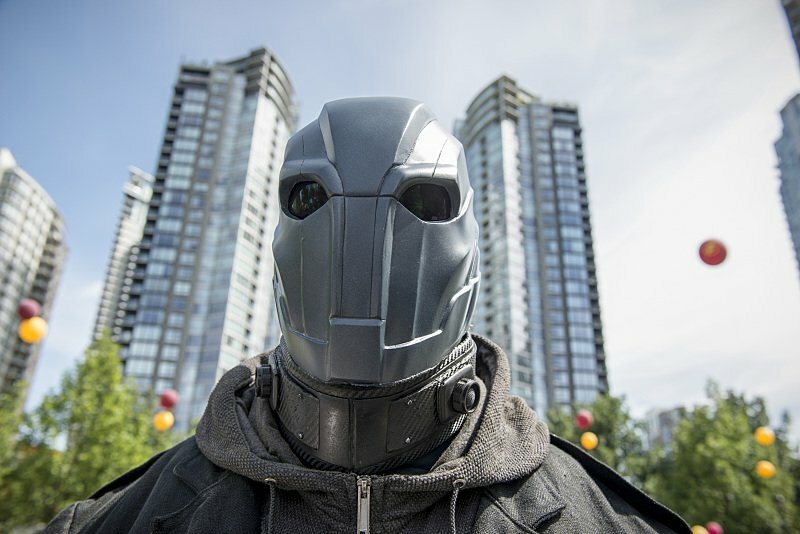 The population wants to thank its savior, however, and decides on holding a ceremonial Flash Day–but Barry's refusing to go and withdrawing further and further into himself. Can his friends pull him out of his inexplicable despair in time to fight a metahuman even stronger than last season's Girder? This episode opens with a fantasy scene; one so realistic and convincing I don't realize it's a fantasy until I see Eddie, alive and unharmed–and we suddenly cut to our hero, standing alone in STAR Labs. Barry's still working, but he's pushing away his friends, and looks like he's still in shock; his friends, led by Iris, are working to get him out of hiding and into at least some of the attention he deserves. It turns out that last season's cliffhanger turned into a double tragedy: not only did we lose Eddie from the team, but Firestorm followed the Flash into the Singularity in order to collapse the event horizon. While Flash and Martin Stein escaped, Ronnie Raymond is lost or presumed dead, swallowed by the unforgiving event horizon of a growing black hole. Survivor's guilt is a terrible thing. I'm fairly certain Barry's falls into the category known as "imagined" guilt. Which is to say the events which happened, happened-at least until he travels through time. But Barry had no control over those events and only imagines he does. Had he stopped running around the black hole to contain its growth, Robbie and Stein would both surely have died. Had he prevented Eddie's death, Wells would likely have killed them all. 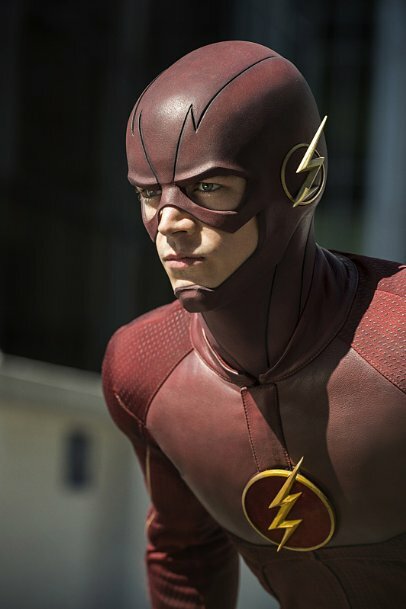 To some extent, Barry's channeling his guilt into running and saving others. He's also very likely got a self-fulfilling death wish, and Iris is entirely right that Barry needs to man up and admit Cisco and Dr. Stein and others contribute to his success. I was glad that Iris convinced him to go to Flash Day. Barry needed the boost. It's a testimony to the strength of the team that, when Iris calls, they're able to reform; even Caitlin, twice filled with guilt and loss over the second or third loss of Robbie (he died in the first accident, then sort of "died" when he became Firestorm in a different way, and now he's gone popping out of a black hole), comes when she's needed. If there's a weakness of this episode, it's that there's too many plotlines. Somewhere in between all this action, Barry gets a visit from a lawyer–and Wells has left Barry both STAR Labs and a mysterious living will. Caitlin convinces him to check it out, and a very emotional and honest message from Eobard Thawne ensues... during which he confesses the murder of Nora Allen. Of course, this means Barry's Dad goes free. Grant Gustin does a remarkable job showing the gamut of emotions as Wells/Thawne goes through his message–and incidentally, opening the message means STAR Labs stays in Barry's hands. I'm not sure this next part is a weakness, but it made me furious. They bring Barry's father home, make him a cake, give several tearful speeches... and then Barry's dad leaves. He tells Barry if he stays he'd be holding Barry back from growing up–and let's keep in mind we have a college-educated forensic specialist under discussion here who's just rescued the world from a black hole, folks. Then he walks out of Barry's life. I personally think he's terrified he can't compete with Joe and the ghost of Harrison Wells - or the high-class Martin Stein, whose good (but slightly pompous) speech is the last thing he hears before he breaks loose. All this feels as if it's happening almost too fast. Barry even accepts it more easily and quickly than I thought he might. 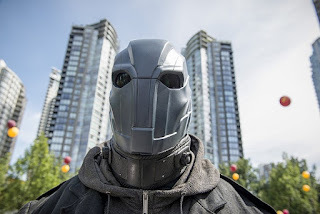 Oh yeah, and then some dude who's been taking photos of Barry all episode shows up and gives him a Dire Hellmouth Warning; he calls himself Jay Garrick, but could he be Zoom? After last season, and more than one shapeshifter, I make no assumptions–and neither should you. The captions were a mess. I just rewatched parts of the episode on Hulu, and the online captions were so much better than the prime-time captions it's ridiculous. The captions were appearing seconds before and after people spoke, on my end. I was able to keep up but... Other friends reported dialogue gaps in the captions. Sort of hoping that the CW gets its stuff together on this. I don't know if this show plans for Cisco to actually get controllable powers, but his ability to see to other worlds seems to still be here. Looking forward to his developing these powers over this season–and here's hoping he never loses his innocence. Cisco begging for a badge, and getting one by the end of the episode! Joe making Barry feel better by saving the Key to the City for him. So cute! Iris: Yeah, but he should go. Someone should try to get through to him. Joe: Maybe his best friend? Cisco: Joe, believe me. I have tried! Joe (indicating Iris): I meant her. Caitlin: STAR Labs is safer than ever. Increased security and surveillance. Cisco: Recoded, double firewalled, electronic locksets. Nothing is getting through here without us knowing. Iris: So people can't just waltz in and out of here. This episode hit so many buttons I didn't know what to do. It definitely kept up the pace of the previous episode, but it feels like the central part of a three-parter. I can't wait for the follow up. Four out of four metahuman-enhancing Boots. in time to fight a metahuman even stronger than last season's Girder? It definitely kept up the pace of the previous episode, but it feels like the central part of a three-parter. Very true! The problem I had is that I'd sort of forgotten a lot of the events of the season finale, and I had an embarrassingly hard time remembering what had happened, which made this episode very confusing at first. Yes! The Herculean Husb. was muttering with me that we wished we'd watched the finale before starting this season. Things started coming back though. Me three. I was absolutely confused. But it was still a great episode. I think the Barry's dad thing, which I also found somewhat infuriating, was just the producers wanting to sew up the dad in prison storyline, but not wanting to pay the actor for a full-time gig. It would have made a lot more sense if he had hung around for a couple of episodes before taking off to see the world, though. I know I've said this before, but I am so enjoying Spy Dad in his new gig. Henry leaving reminded me of Giles in season 6 of Buffy and it pissed me off so much. I understand they don't want him in every episode but it would have been simple to come up with a reason for him to be absent that didn't make him seem like the world's worst father. "I'm holding you back." How in the world is that true/could he know that to be true seeing as he got out of prison ten minutes ago. Ugh. Cisco is beyond precious and his delight when Dr. Stein named The Atom Smasher was possibly the cutest thing ever. Like Billie, I am also loving Victor Garber. Mostly because he's Victor Garber. Like all of you, I really loved Cisco bonding with Stein over the metahuman naming! But I’m still confused about the time travel mechanics; it makes no sense to me that if Eobard Thawne was erased from existence that the past and present we’ve come to know would remain intact. (If he didn’t exist anymore, then how did he go back in time to murder Nora Allen?) 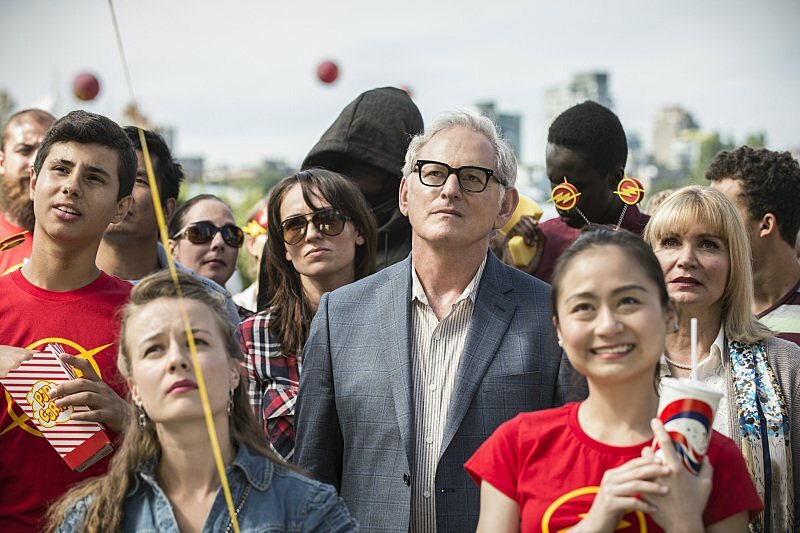 Especially when we previously had Barry able to rewrite time after the Cisco murder/tsunami situation. But I remain hopeful things might get explained better in weeks to come. And that the process will let us better explore Cisco's emerging abilities. I liked it, but it wasn't a particular strong season opener. Yet another generic villain complete with silly abilities and the usual bad dialogue. Was I the only one who thought it was Bane at first? The bat-signal thing made me groan. I don't mind a bit of cheese but this show can take it too far sometimes. Completely agree about Henry not staying. 'Holding you back' makes no sense at all. Also talking about Barry being The Flash in a police station while surrounded by cops, Really? The characters are still a lot of fun and watching them interact is as enjoyable as ever. Can we dispense with the Barry as Batman 'I have to do everything alone' thing though? Had enough of that in Arrow. I'm totally confused. Professor Zoom is the Reverse Flash. So is Eobard still alive somehow? I'm with you all... How is the part and present still working out if he's been erased from existence? I was also sad to see Al turn out to be a villain instead of the superhero he is in canon.